« The mystery illness and a thank you. The past two years my in-laws have made the five-hour trek from our home state out to our current residence of Pittsburgh, PA for one purpose on Easter weekend: The Grand Concourse Sunday Brunch. If you snicker you have clearly never been to said brunch. We had found the brunch because it had been on a friend’s “bucket list” of things to do before leaving Pittsburgh (which I am quietly composing in my head as well). For the non-meat and fish eater, you don’t really get your money’s worth. But if you eat at least fish it is fantastic. It is everything awesome about gluttony. The highlights include fresh donuts, omelette, pancakes, and waffles to order, bananas foster, carving stations with ham, roast beef, etc., lox, different types of fish dishes, and the list goes on and on. This year it was just four of us (my brother-in-law and his fiance stayed away this year) but we made the most of it. The big problem with going to the brunch is that you’re absolutely stuffed until at least 6pm. This doesn’t make trying to plan an Easter dinner very easy. 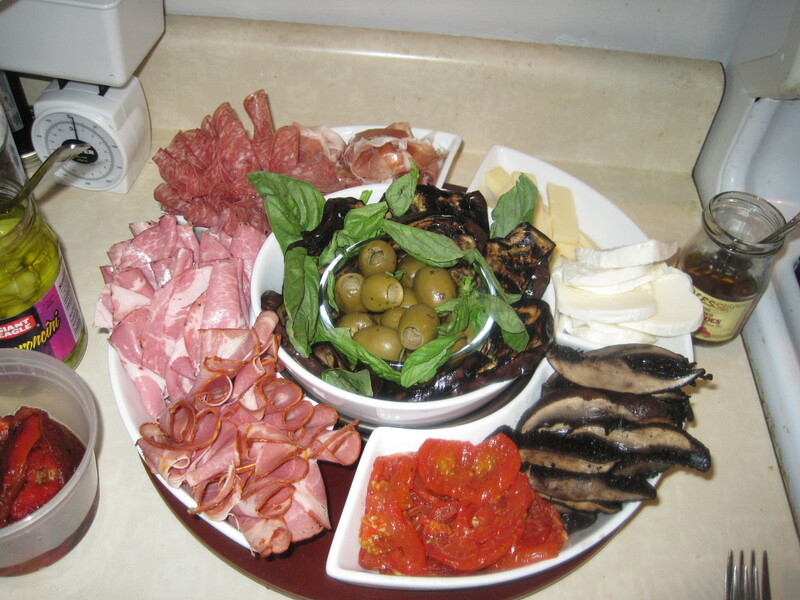 What I decided to do was to come up with a antipasto platter and a tomato and mozzarella salad. I also had some back up appetizers (cocktail shrimp and, if necessary I was planning on whipping up deviled eggs) in case the four of us were hungrier after 6pm than I expected (we weren’t). Since very little cooking was involved this was a great quick and easy way to feed the family without all the hassle. I did roast a lot of vegetable a few days earlier so the prep time was more extensive than the actual cooking time. Also, this let everyone take what they wanted since we were all at different levels of hunger from the brunch earlier in the morning. (I didn’t calculate the points here because it all depends on the size of your sandwich and exactly what you put on. Since I was only eating the roasted vegetables I estimated about 1 tsp olive oil for those since I had drizzled it on top after roasting, the PointsPlus for the bread, cheese, and marinated artichokes). I used a very crusty Tuscan italian loaf from a local bakery. I was looking for something that would hold up to the liquids produced from the roasted vegetables. The woman at the bakery had originally suggested a ciabatta bread but I did not think the inside would be dense enough. Even this denser, crustier bread got a little wet from the vegetables. 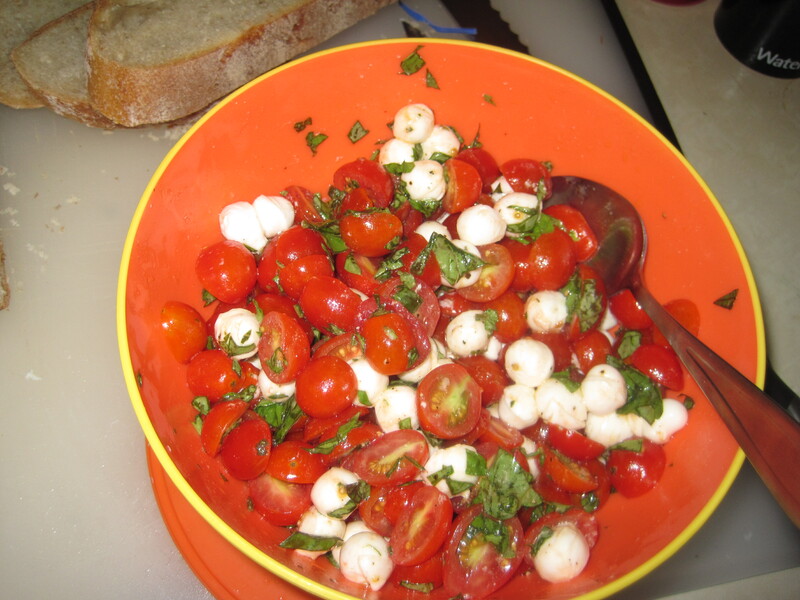 Mix all together but be careful not to over mix and break apart the tomatoes.